Ira’s signature postgame column. Enjoy! Welcome to Tampa, the new nerve center of the National Football League. Pat Mahomes is going crazy in Kansas City and few expected the Dolphins to open 2-0, but Ryan Fitzpatrick and his merry band of marauders are setting the water cooler conversation. The Bucs just knocked off the defending NFC South champs on the road and the defending Super Bowl champs at home, a sweet exacta that only the most ardent of Tampa Bay fans could have envisioned. * You know who you are. You know whether you were one of the thousands of skeptics who had this franchise relegated to an 0-3 start when the schedule came out five months ago. When Jameis Winston was suspended, the number of cynics grew in strength, but as Evan Smith told me a few weeks back, these are the teams you never see coming. * DeSean Jackson kept his cool last season through the missed connections and the losing. Now he’s showing why Jason Licht targeted him at the start of 2017 free agency, averaging a startling 30.6 yards on his nine receptions. He opened Sunday’s game with a 75-yard TD and helped seal the deal with a critical 17-yard catch on 2nd-and-13 with 2:30 remaining. * Kwon Alexander didn’t register a sack last season in 12 games, but he was very effective on the blitz against the Eagles, jarring the ball loose from Nick Foles for a late first-quarter takeaway. He added 7 stops, including 3 tackles for loss, and a QB hit in setting a fierce defensive tone. * Give it up for the much-maligned Ryan Smith, the third-year DB who had struggled everywhere but on special teams. Smith was outstanding on Sunday with 7 tackles and 2 passes defended, besides his usual superlative work on coverage teams. Without Brent Grimes and Vernon Hargreaves, the Buc secondary needed somebody to step up –Smith was eager to oblige. 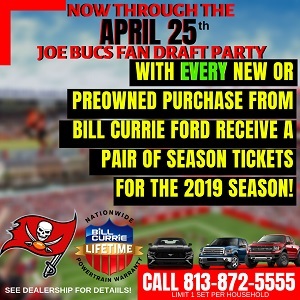 * Even Sal Paolantonio, the savvy ESPN broadcaster who bleeds Eagle green, acknowledged that the Bucs are the talk of the league. He appeared shocked at Tampa Bay’s big-play capability, but Sal Pal shouldn’t have been surprised because he used to watch Jackson wreck defenses during his six seasons in Philadelphia. * Although the heat index reached 105 degrees, the Buc defense played with conviction, especially considering these guys were on the field for 75 snaps. Vita Vea and Mitch Unrein are unavailable, Noah Spence was inactive and Tampa Bay lost Beau Allen and Chris Conte to injuries during the game. Jason Pierre-Paul, far from 100 percent, came up huge with a sack and 4 of the 12 hits against Foles. * The Bucs may be 2-0, but I’m not letting Chandler Catanzaro off the hook. He missed what could have been a key FG in New Orleans and on Sunday, he was wide right on an extra point. Right now, he’s a footnote, but Catanzaro needs to sharpen up his game. * Tampa Bay’s pass rushers know they can’t hunt unless they first stop the run. Mission accomplished through two weeks. Opponents are averaging only 3.6 yards per carry and 67 yards on the ground, 50 yards less per game than last year’s effort. * One big difference from 2017? The Bucs are cashing checks on the money down. Tampa Bay has converted 12-of-23 opportunities on third down, compared to only 9-for-24 by opponents. * Ryan Fitzpatrick has thrown 61 passes through two weeks while suffering only two sacks. Yes, opposing defenses are offering less of a challenge to Fitzpatrick than a Rubik’s cube, but that doesn’t happen without solid protection. The O-line is a big reason why Tampa Bay’s array of play-makers is lighting up scoreboards. Now in his 40th year covering the NFL, Ira Kaufman is the most revered sports personality and writer in the Tampa Bay area. He scored a full-time seat at JoeBucsFan.com world headquarters in July of 2016. 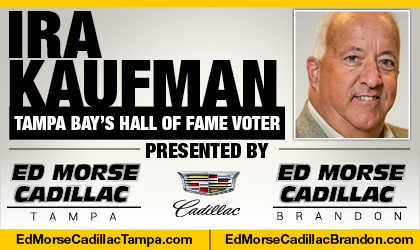 Tampa Bay’s only Pro Football Hall of Fame voter, Ira busts out columns here every Monday, Wednesday and Friday, and his award winning podcasts fire Tuesdays and Thursdays. You can also hear Ira on SiriusXM Mad Dog Radio Wednesdays at 5 p.m. Also a TV star, see Ira now on Mondays at 10:30 p.m. on Spectrum Sports 360 (aka BayNews 9). Ira also is part of the FOX-13 Tailgate Sunday NFL show and enjoys beet salads, Riesling, tennis, Chiefs victories and needling Joe. Well said Custodian of Canton, well said! Spot on Sage, keep up the great work. Really looking forward to Tuesday’s podcast. That steep climb to the postseason looks a lot less daunting when the Bucs stand alone atop the NFC south standings. Go Bucs! Beat those Steelers!! Probably the biggest reason. Coach K agrees. Exactly! That O line is very deserving of much praise….and Ryan Smith may just be finally developing into a good corner. He’s been thrown into the fire before so its time. With Catanzaro what you see is what you got. Cross your fingers when he kicks for points. Our offense will score. We need to keep this Defense Hungry. IF..they improve every week. We will be a force to be reckoned with. But the key is our Defense. Not the O. We have built that. The Steelers game will be brutal. Very physical on both sides of the ball. Steelers are pissed. We should be even..Piss-ee-er!! And if Fitz wins 3 in a row? Bucs staf would be STupid to bench him in favor of Winston. make him earn hias spot back. Tine for Wine?? BS!!! Ok..maybe one night. But folks..its game 2. 14 more to be played..and many more injuries to come…. Keep improving this DEFENSE!!! First team in Modern history to start 2-0 against teams that won 11+ games the year before. Excellent points as always Ira. Folks need to give the rookies some love too because they’ve improved steadily under fire through these first 2 games. Bucs defense did several other impressive things today. For one thing, 3 sacks going against a pretty stout Eagles’ OLine is a positive. For another, we held their offense to 5-of-15 attempts on 3rd down. Also, we held them to only 91 yds rushing in 24 attempts (less than 4 YPC). All-in-all, a definite improvement over last week far as I’m concerned. 30 yards a catch is filthy. Fitzmagic owns the long ball. He Connor mcgregor look was classic. He is bringing some swag into this team. Right on the money Mr. Ira. So glad you’re on JBF. Good call guys. We’re not trading Winston, don’t be stupid. He’ll get the job back at some point and I fully expect he’ll be a much better QB for the experience of seeing Fitz at work. Winston is a very smart QB who makes stupid decisions at times. If his decision making improves he’ll probably be a HOF candidate at the end of his career. His skill set is top tier. Fitz is decisive and fearless. He should be with these targets. His lone INT was a catch/fumble by OJ. Man, OJ is a beast!!! How many TEs can take it 75 yards? When was the last time the Bucs were the headline at halftime of Sunday Night Football? Fitz is the man. Joe Blahak…..you’re funny…and so is everyone else that wants Winston replaced with Fitz….I won’t even debate it with you guys anymore…cause Fitz is riding high and so are the Bucs….again Fitz is playing….with…. THEE weapons for Winston. Fitz has never had this arsenal before in his career. Again…Winston’s weapons….Winston’s o-line too. Give him that time….we all know what will happen. Some of us just don’t want to know it. I HOPE Fitz is the second coming of Kurt Warner and he takes our team all the way to the Super Bowl. I really do and I’m prolly one of Winston’s biggest fans. Fitz can take us there a couple of times if he’d like. If all or any of that happens than I’m more than willing to give up(not on) Jameis so he can go win somewhere else…and he will win….that kid will win Super Bowls either here or somewhere else. They play him split out a lot, I’ve noticed. A WR in a TE body. Ira, the “money down” is first and second down where you avoid going to third downs. The successful teams try and stay ahead of the sticks. Also…it is a passing league not a running league. Sure, you must stop the run when presented, but the run game isn’t what puts points on the board for successful offenses; it’s the pass game. That’s a backward mentality…stop the pass first while rushing and getting pressure in the qb’s face, then play the run. This offensive explosion is mostly due to the Offensive Line pass protection. Last year Buc QB’s were sacked 40 times. This year so far 2 sacks in 2 games. I might add the RB’s are picking up the blitz too. The skill position guys are matchup nightmares for DB’s as we know and with time to throw and pick out the mismatch Fitz is lighting it up. The OL must continue the stellar play for this to continue. It won’t matter who is at QB if they keep it up.